Woeful Nats: Chicken Man Agrees, Nats Are On Fire! 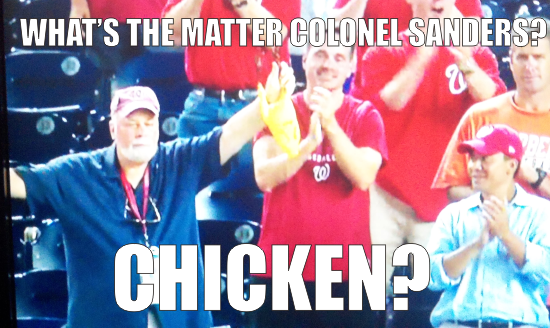 Chicken Man Agrees, Nats Are On Fire! The Nationals offense was on fire against the Cubs and with help from 19 hits and 6 homeruns the Nasty Nattys beat Chicago 11-5 on Tuesday night in DC. Edwin Jackson was good early, and the Nats bats helped everyone look past Ghetto Cheese's 5 2/3 inning 7 hit 4 run performance. All 9 starters got a hit for the Nats and they were given homers from Adam LaRoche 2x, Ryan Zimmerman, Ian Desmond, Jesus Flores, and Tyler Moore. 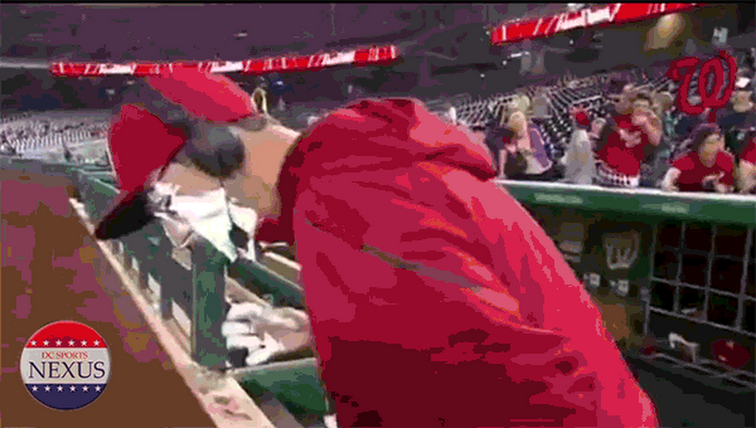 Everything was clicking for the Nats who even picked off a runner on base. The Cubs used 7 pitchers, including 5 different pitchers in 5 innings. With a Braves loss the Nationals now lead the division by a comfortable 7.5 games.